1. The robot structure is made of PC board and aluminum plate. 2. Three servo motors are used to control the robot movement. 3. Power source: AC adaptor or batteries. Movement of robot depends on how microphones are triggered. It can turn left, right or move backward, accordingly. 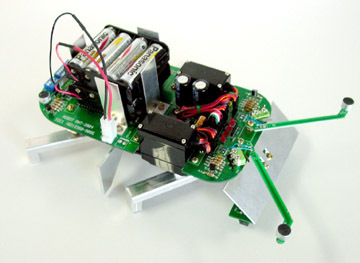 robotic ant turns right, vice versa. 8. Remote control mode: optional remote controller available. 9. Detailed circuit diagrams and operation procedures are included in the manual.